To celebrate ten years of Southern Music Issues, most of which are sold out or very hard to find, the fifty-five essays collected in this dynamic, wide-ranging, and vast anthology appeal to both music fans and fans of great writing. Here you’ll find writers like Peter Guralnick, Nick Tosches, Susan Straight, William Gay, Tom Piazza, Roy Blount Jr., R. Crumb, Rosanne Cash, Lucinda Williams, Elizabeth Wurtzel, Jerry Wexler, and Steve Martin probing the lives and legacies of southern musicians you may or may not yet be familiar with. In one creative, fresh way or another, these writers also uncover the essence of music—and why music has such power over us. 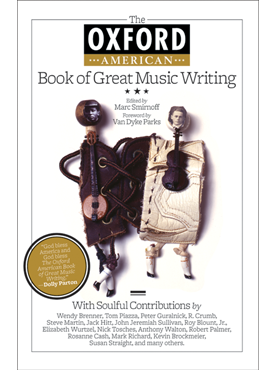 From blues to rock ’n’ roll to jazz to country to bluegrass, from interviews, reviews, analysis, reflections, and biographical portraits, The Oxford American Book of Great Music Writing has “something that will inform and excite you”—Nashville City Paper. Course Description: Instruction and intensive practice in researching, analyzing, and composing written arguments about academic and public issues.